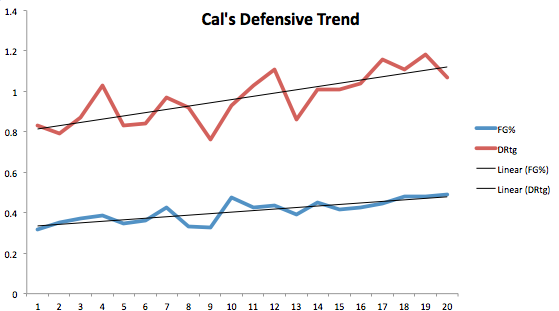 Consider, this graph of Cal’s defense as its trending along the season: Teams are scoring more frequently and more efficiently as the season progresses. Cal is losing more frequently and by greater margins as the season progresses. A “rolling offense” ain’t changing that. Rare to escape the cellar on a weekend where you get swept but at least it wasn’t at home (Cal) or by a cumulative 53 points (Cal) or by yielding a cumulative 49% shooting (Cal). Basically, isn’t Cal so they aren’t the worst team in the conference right now. When I left Maples Pavilion after three thousand fouls, 160 minutes, this photo, and just a few more fouls for good measure, I went to The Old Pro. I love the local college bar and this is a great one. Of course Stanford isn’t your average college but neither was UCSD. I’ve digressed. Let’s note that Old Pro has P12N. That’s huge. What I also noticed Thursday night was the margin by which ASU was beating Cal at the half. It was 34-13 and kept growing to a final margin of 35 points. ASU shot the ball fantastically. Or at least serviceably when including their loss at the aforementioned Maples. Herb’s wisdom remains valid. The Bruins are the best of the swept teams! Four teams went winless this weekend (conversely four were undefeated!) and UCLA I guess is the best of them. For the weekend, Steve’s son shot 23 three pointers. Conversely, Arizona shot just five in Berkeley – that’s the fewest since 2008 – and I took my parents to a tequila bar playing dubstep (accident). Interestingly enough, UCLA was swept in Oregon for the second time in three trips. Tony Parker didn’t travel to Eugene which only further shortens Steve’s bench. Things aren’t trending well for the Bruins. So when I was talking about winning not being everything and moral victories and such? Yeah the Dawgs don’t care. They filled the left column in Boulder and that’s all they needed to do especially knowing that the Utah part of the Ski Trip is miserable. LoRo’s team would drop that one by a classically significant margin. It’s ok because they eeked out a win on an Andrew Andrews buzzer beater. Classically cool. I can’t say that it was at Klay-levels, but they were approaching. Say, wasn’t Klay Thompson a Los Angeles area kid? Enough about schools not named Oregon. Big sweep at home for the Ducks. Look I’ll be the first to tell you that Oregon State is not an NCAA tournament team. But what if they are? It’s becoming increasingly hard to ignore things like their KenPom ranking (62), defensive efficiency (15th in the nation), RPI (64th), or noting that they still have shots at Arizona (1/30), Utah (2/19), and Stanford (2/26). The feel is such that it’s a toss up whenever they take the floor. They’ll play six of their final eleven on the road but let’s note today (1/26) as the day we at least thought maybe. Utah was as soft as it has been all season. Arizona hit one 3, Utah hit nine, and the Utes lost by 18? How is that possible? Why didn’t anybody on Utah get pissed off over giving up so many offensive rebounds? He had a point and what I questioned here was how would they respond? Well the Utes promptly swept the Washingtons in blowout fashion, staying the course of their season and not doing things like throwing gimmicky zones. This was something K2 instituted against Arizona which – to me – suggested to his team that they’d already lost. Getting back to the Hunt and their style of play was big for Utah. Things are fine.